A carrot is one of the vegetables that can be classified as being versatile, the tomato being at the top of the list. Should you want to snack on something healthy, you can easily grab a carrot and start biting into it. Or if you are hard pressed of time and want a healthy snack for kids, you can give them a couple of carrots and cucumber cut into julienne strips and some tomatoes . And the best thing is that there's no preparation required, except washing them of course. Carrots are loaded with vitamins, minerals and nutrients vital to our bodies. These include Dietary Fiber, Protein, Vitamin A, Thiamine, Niacin, Riboflavin, Vitamin B6, Folate, Vitamin C, Calcium, Iron, Magnesium, Phosphorus and Potassium. But like sweet potato nutrition facts have shown, carrots also contain a great amount of Vitamin A. Follow the link and learn more about the health benefits of Vitamin A. Because carrots, like most vegetables are naturally low in calories and do not contain fat or cholesterol they are a part of many weight loss programs. When considering raw carrots and their nutrition facts we can see that they are low in calories and sodium. They are however an excellent source of Vitamin A. It's also a source of Calcium, Iron, Thiamin, Vitamin B6, Niacin, Potassium and Manganese. It's a good source of dietary fiber and vitamin K.
Cooked carrots are just as nutritious as raw carrots. The vitamin A content once again is outstanding. 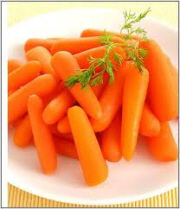 Cooked carrots are also a source of calcium, vitamin E, Thiamin, Riboflavin and Zinc. It's a good source of fiber, vitamin C, Vitamin B6, copper and manganese. Be careful when you cook your vegetables not to overcook them or you'll lose the minerals, vitamins and nutrients that your body could get from them. Nutrition facts of carrots that are shredded or grated show us that they are a good source of fiber, Vitamins C and K. Again, we can see that they are an excellent source of Vitamin A, exceeding the recommended allowance. Carrot Juice nutrition facts show us that it's a good source of the following vitamins and minerals; Thiamin, Vitamin B6, Potassium, Phosphorus and Magnesium. It's an excellent source of Vitamins C and A. These are carrot cake nutrition facts for a carrot cake with icing. This is one of the favorite cakes of most people. However, if you want to be eating healthy, but still love cake, you may try some of our healthy cake recipes. This carrot cake is a bit high in calories and fat. It also doesn't contain much in terms of nutrients. 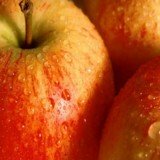 It's a source of Potassium, vitamin C, protein and dietary fiber. These are Cream of Carrot soup nutrition facts prepared with milk. You may have this as an appetizer or just as comfort food. The only problem perhaps is that it contains a high amount of cholesterol, otherwise all else is kept in check and most of the other nutrients are present. Carrot muffin nutrition facts show us that they contain quite a bit of fat, cholesterol and sodium. It however is a good source of calcium and iron. You may also try out some more healthy muffin recipes. So whether you like carrots in juice, soup, muffins, cake or just raw, as you have just seen, they are an excellent source of Vitamin A. So go ahead and grab a carrot!